As of 29 October there might be shopping lists that say: ‘bread, handkerchiefs & a last will and testament’. 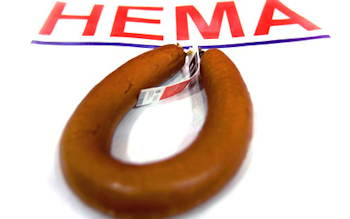 HEMA, a popular shop with branches all over the Netherlands, famous own branded products at a relatively low price, and their smoked sausages, has started offering notarial deeds. After answering 11 questions on their website and after filling out a form, a notary of your choosing will contact you and set up an appointment for the singing of the deed(s). HEMA offers thus far only a co-habitation agreement and a last will and testament. The prices for these deeds are 125,- EURO per deed, which is, according to a representative of HEMA, roughly half of what you would pay elsewhere. Currently there are 26 Notaries in the Netherlands involved that notarise these HEMA deeds. A co-habitation agreement (samenlevingscontract) is a notarial deed specific for partners that do not necessarily want to marry (at this time) or enter into a registered partnership, yet do want to arrange certain matters between the two of them. Matter such as the division of costs for groceries, clothing, and other living costs and also how to divide the household assets upon a separation. Often, a co-habitation agreement is also entered into because of the fiscal benefits attached to it, or in order to receive a partner pension. Arrangements about partner-alimony in the event of a separation. One of the partners does not want his/her children to have access to their share if they reach the age of 18 and both of the partners have passed away. Furthermore, it is only possible that both partners get a will, HEMA will not arrange for a testament of one partner and have the other partner be left with no will. If it is arranged, than it has to be arranged ‘properly for both parties’, according to HEMA. Each deed costs 125 EUR. This includes VAT and the costs for registering in the registry of testaments and/or keeping the particular agreement in the vault of the notary. That HEMA can offer these deeds at such a low price, is explained by the fact that these deeds cover ‘standard’ situations, with little to no complicating factors such as one of the partners (or both) having quite a bit of capital, and no children from previous relationships. If a couple deviates just a little bit from the standard, then the HEMA deeds will not be suitable for them, and they are quickly looking at a price tag well above the 125 EUR. This means that in particular young couples, that are about to move in together, or have just done so, preferably in a rental home, with little to no capital of their own, and without children, or with children of the two of them, will be eligible for the low price. The Royal Dutch Association of Civil-law Notaries (Koninklijke Notariële Beroepsorganisatie, KNB) has stated that initiatives like these are not new, and mentions that the low price offered by the notaries attached to HEMA for these deeds, is a consequence of the fact that since 1999 the market has been opened up and notaries have since been free to set their own prices for their services. What is interesting is that with this opening up of the market, the process of standardization has taken flight. We see this also reflected in the deeds required for a transfer of land. Conveyancing of land in the Netherlands requires a notarial deed that is registered in the public land registry. This registry is kept by the Cadastre. The Cadastre has attempted to facilitate the process of conveyancing with introducing KIK-deeds. In short, these electronic deeds are a way to electronically deliver, in standardized form, deeds of delivery of land or a deed to register a hypothec etc. (for some model deeds click here). The process of drafting up and subsequently registering a notarial deed is simplified and has become speedier by using these KIK-deeds. Because the process is quicker, also on the end of the notary, this automatically diminishes the workload of the notary, and hence the price for such a deed. Note, this of course does not discharge the notary of his obligations to carefully inform the parties of the juridical consequences of these deeds, which the KNB stressed is a very important task of the notary when it commented on the HEMA deeds, nor does it discharge the notaries of their duty to check the accuracy of the deed, nonetheless it does do away with a some of the ‘paper mill’ that comes with the process of conveyancing land and limited property rights in land. It is interesting to note that standardization efforts now also take place in the area of wills and co-habitation agreements. This in no-way diminishes the necessity of notaries, which are indispensible for those cases that are not ‘standard’, but for those cases which are ‘standard’ it makes arranging your affairs properly cheaper and hence more accessible. Therefore, the fact that HEMA has started offering low-cost notarial deeds, aimed at arranging ones affairs vis-à-vis your partner and making sure your children and partner are taken care of in the event you pass away, is a welcoming development. This opens up the market of testaments and co-habitation agreements to those people with a little bit less to spend, and that should be supported. It will remain to be seen whether the standardised and simplified deeds satisfy an actual need in the market. Not every notary seems happy about HEMA’s new venture. One office of notaries has set up the website www.hema-notarissen.nl where they offer a discount of 125 EUR on their co-habitation agreement and testament, if you bring a warm HEMA smoked sausage. Another office of notaries states: “As HEMA has entered the notarial business, we are going to sell smoked sausages”, taking a jab at one of HEMA’s most well-known products. On 14 November, The Royal Dutch Association of Civil-law Notaries (Koninklijke Notariële Beroepsorganisatie, KNB) had put out a press statement in which it announced that is taking the notaries (or some of them, this is unclear as of yet) to the Disciplinary Court for notaries, as the Board of the KNB questions whether or not the notaries attached to the HEMA-deeds live up to the notarial rules and regulations. In its statement the KNB expresses concerns and questions about the fulfilment of the duty of care exercised by the HEMA-deed notaries. In particular, the brunt of the work is left to the consumer(s) themselves, who supply HEMA (and with it the notaries attached to this project) all the required information by filling out a simple online form that they send via the HEMA website: https://notarisservice.hema.nl. Afterwards, a notary of their choosing will contact the consumer(s) to set up an appointment. It is at this point that the notaries become involved. They will meet with the parties and go over the deed and its (legal) consequences. To me, this sounds no different from the regular practice of notaries, save for the fact that normally you would have a first meeting in person, via telephone or email by which you request the drafting of a deed and give the necessary information, rather than do all of this via the HEMA website. Hence, only the initial contact with the notary and the data-supply seems different, whereas the practice after first contact seems no different from an ordinary meeting with the notary. The KNB, however, is a bit more wary and has asked the disciplinary court to look into the matter. The KNB states that this practice, of taking work from the notaries and giving it to the consumer, could be a danger to the fulfilment of the duty of care the notary has for the legal protection of the consumer. It would therefore like to start a discussion within the ranks of the notaries about how these new societal and digital developments give rise to a possible new interpretation of the duty of care without degrading the legal protection awarded to consumers. Thus, next to wanting to hear the disciplinary court’s opinion on the HEMA-deeds and the role of the notary, the KNB would also like to start a discussion about the role of the notary in a changing society. When asked for a response, HEMA is stated it was ‘surprised’ by the statement of the KNB. According to a representative of HEMA:”this is not a new phenomenon. There are more websites that offer services like this.” According to her, perhaps the KNB was unpleasantly surprised by the large amount of attention given to the HEMA-deed. What is your response to the announcement that HEMA has started a notary’s service? Do you share the opinion that this practice can lead to clients being insufficiently informed about the effects of their choices? If not, why not? Do you think that this practice is desirable and is there enough room for clients and the notary to come to a balanced judgement? If so, why? In which way can it be ascertained, prior to payment having been made and the draft deed made, whether the client: is competent to act, can ascertain the consequences of a last will and testament or a co-habitation agreement, or that the client has not been pressured by a third party? Are you going to take action against this notary’s service to ensure to prevent that clients, in the final execution of the deed, are confronted with unwanted situations which lead to an increase in (legal) procedures? If so, what actions are you going to take exactly? If not, why not and how are you going to prevent that this will apply to multiple legal areas? Additionally, the Deputy Minister does not currently see any reasons why he should intervene in these practices or prevent that this initiative spreads to other areas of the law. That latter point is very interesting, as HEMA has recently started offering a low-cost health insurance, and the CEO of HEMA, Ronald van Zetten, has said that while they are currently not working on it, they might in the future start offering mortgages as well. While the Deputy Minister appears to be in favour, he was also keen to stress on numerous occasions in his answer, that of course these types of initiatives should stay within the limits of the law. Hence, he supported the fact that these practices were put before the Disciplinary Court. The Deputy Minister considers the question to be first and foremost one that requires the attention of the professionals themselves and is of the opinion that the Royal Dutch Association of Civil-law Notaries and its members together should set the professional standards and find the proper balance. Therefore, it appears that the Deputy Minister seems to be in favour of the HEMA deeds, provided they are properly structured and fit within the rules and standards that come with the profession of civil law notary in the Netherlands. As the Deputy Minister reiterates that the HEMA deed notaries see their clients at least once, and talk to them on the phone also once, to me it seems perfectly logical that there should be no impediment to upholding the high standard that a notary has to fulfil in order to safeguard their clients’ interests. As I mentioned earlier, indeed the way to get to the notary is different, but the procedure when you are there is no different. We’ll see what the disciplinary court says. Final note: this post is a summary of posts on the author’s own website.